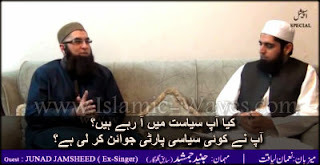 Junaid Jamshed in a special sitting with Nauman Liaquat of Message TV spoke on "Kya Aap Ne Politics Join Ker Li He? Ya Aap Ne Koi Siasi Party Join Ker Li He? ", as the people are anxious about the JJ's political status they want to know about whether "He Has Entered Into The Politics Or Associated With Any political Party".